It’s the way things are done. Tradition. Looking good to others to allow them to see your quiet, simple faith. Being peaceful. But what happens when things are no longer quiet and simple, let alone peaceful? How do you live these things when your world has been turned upside down? When your faith is tested and you find it lacking? This is one couple’s story. Ora Jay and Irene Eash were coming home from visiting friends. It had been a long day, and when driving an Amish horse and buggy, unlike a car, it’s okay to doze off except for intersections. But when Ora Jay dozed off, he was awakened to the sound of a semi truck, his buggy being shattered into pieces, and screams. He found his two daughters dead, and the peaceful life was no longer peaceful. He and Irene joined a “circle letter” for those who had lost children. With eternity so close, yet so far away, they began questioning their faith. This is the story of loss, both of daughters, and the faith they had once so willingly embraced. In its place, they found faith that gave them hope and peace. Ironically, the peaceful life didn’t give them peace on the inside. Leaving the Amish community is difficult. You lose your family, friends, and basically everything you have ever known. Their journey is a fascinating one that spans many years. I very much enjoyed this book. I would have liked for there to have been a bit more about losing their daughters and that painful time — how they coped and got through each day. But I realize that was the tragedy that happened which changed the course of their lives from Amish to “English”, so while it is a heartbreaking event, the focus on the book was more the journey away from the Amish community. This book was co-written with author Tricia Goyer, and her books are always a delight. They are well written, and something you can feel good about reading. 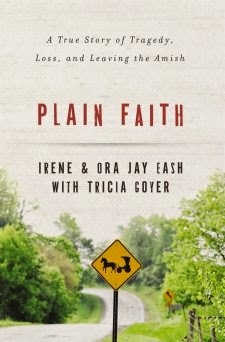 I highly recommend Plain faith to anyone who enjoys Amish fiction (although this is a true story) as well as to anyone who has lost a child.